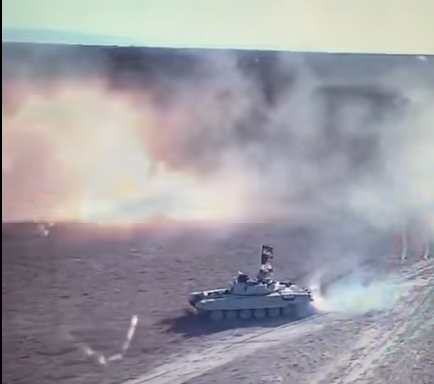 Video: Duel Between Iraqi Battle Tank And ISIS VBIED 4.45 out of 5 based on 20 ratings. 20 user reviews. The Iraqi Popular Mobilization Units have released a video showing a duel between a government battle tank and a vehicle-borne improvised explosive device (VBIED) of ISIS in western Iraq. Engine is in the front so the people inside should be fine. Definitely survived as the BMP is strongly front armour plated. That mass of shrapnel not only launched directly toward the BMP but arced downwards at the exact location of BMP, and all the while that one nearby soldier remained standing and fully exposed as metal shards ripped past until he finally got knocked over by blast impact! Close stuff. Slow reactions from the tank. They didn´t fire their gun? Yeah it was way too close for comfort. At least it was a direct hit. I think, he’s waiting for the people behind to get clear, you can see a guy behind the tank running away when it goes off. The tank did not fire. It kinda looks that way. Well, it did not fire, check the rest of the comments, too. Yeah I read them and then watched that part of the vid a few times. That VBIED had a lot of blast power. 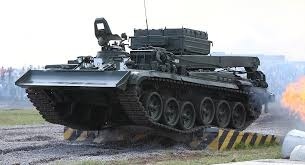 The BMP-1 took it out as stated in the video. The video I’m seeing is in Arabic and has no english subtitles. I understand, I just translated it for you. Southfront is an organisation that runs on donations, they don’t have the means to translate every video. Thanks, gold37. It wasn’t clear to me that your first statement was based on the actual Arabic narration. SF didn’t mention the BMP at all, so the article was confusing when one looked at the video closely. Nobody expects SF to be perfect in every detail in every article. It is kind of disappointing that they haven’t bothered to add a note to the article since then adding what you and Moussa Saab heard on the narration and alejandro casalengo understood from YouTube comments. I know it takes time to look at comments or consider additional information after the articles are published, but (I would argue) that it is important to SF’s credibility, even if it takes resources away from publishing an additional article or two a day. Easy for me to say, of course, since SF is doing all the work. And even on English or Russian – I sow no action by tank. Gold is right, it said the BMP-1 took it down. In Youtube a arab speaking guy say me than the tank falled, the BMP destroy the car-bomb. that BMP 1/2 didnt provide any smoke visuals. As for southfront … there are so many russian into english rough translations, like how southfront (is) using the budget. I can’t slow the video down so pw may be right, but I swear the tank’s turret rotates in time to the movement of the VBIED (which stopped for some reason), and there’s no muzzle flash from the bmp1. Agree – the tank’s gun was clearly tracking the VBIED. Everyone else must have been firing at it too, including the BMP. The caliphate no longer exists so the only reason that drives these fanatics to suicide it’s their friends and relatives receive so much money from the West and from the Gulf monarchies. Well if you can see exactly on 1:06 very good if you see very good the Tank did not shoot the VBIED, the Daesh fool detonated on him self. So the tank didn’t destroy the VBIED I even add this on Vegas Pro 15 and I was seeing frame by frame tank didn’t show any shell. Don’t confuse your self’s that the tank shoot the VBIED. But it would be nice if he shoot him but all ok. I wonder why they didn’t shoot. Definitely looks like the suicide bomber self donated. Sad ending, hopefully the end of ISIS will also be the end of their whole way of thinking. I agree. Spent some time rewinding and moving step by step – I found no clue that tank done a thing. The VBIED done it alone. tank apparently missed the rather low-profile vehicle, you can see lot of the smoke/dust before that T-72. That BMP-2 seemed to be getting in a much better position though I saw no autocannon or 73 mm gun fire either. This quite a FAKE! – The battle tank did only follow the VBIED with his canon but did not fire! If it had fired with its main-canon we would see the exhaust of burning powder, but there is nothing! So the driver of the VBIED exploded himself! 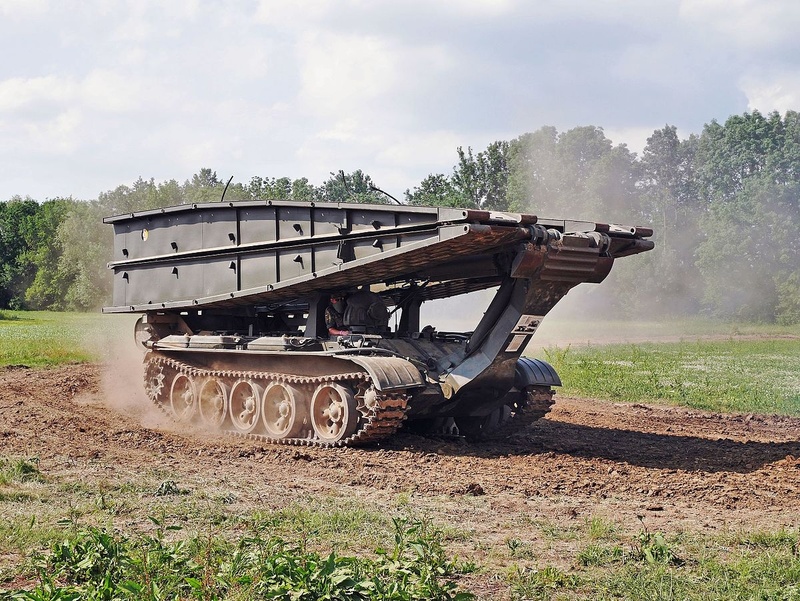 Would have been better if the tank had engaged from 1000 meters – close call! You can see the VBIED taking hits from 30mm or something, so it probably wasn’t working very well. The tank crew didn’t seem to twig until the last minute. Maybe their main gun was out of ammo? South front, what is a BATTLE tank ? Is it a Main Battle Tank, or a what ? I think people can distinguish between tank and a tank … or is it that bojovoj tank that is always used in Russian, getting always translated into a ‘battle’ tank ? I mean, there are light, medium, heavy, then so-called main battle tanks, but really a WW2 trend continuation with west using mostly heavy tanks with stronk propulsion, while Russian T-72 with 39.5-40 metric tonnes, was a replacement for the mediums of T-34/54/55/62 line. Sure it was more of an ‘elite/heavy’ replacement for T-64 superlight fail. When T-80 proved to be what it was, that medium design got pumped up into a ‘heavy’ T-90. From some 40 tonnes (similar to late T-55s) T-72 design became that formidable, yet more costly ‘heavy’ T-90. Is it a battle tank ? Or a peace tank, or war tank ? I mean, such naming smells so much of a direct translation/transliteration of Russian that it is funny. Osnobnoj bojovoj tank … ? So why not just ‘tank’ instead of a ‘battle’ tank ? I mean, its like a sword, is it a war sword, or a battle sword, or ‘broad’, long sword ? I mean, are there actual non-warfighting tanks? If there was a flamethrower tank, I bet it would be ‘battle tank’ … a tank is a tank. Seriously SF. But some might define a tank as anything built on a tank chassis. Why waste a 120mm tank round if a 50mm cannon or even a rifle shot from the side would do?